Cornstarch helps crisp up the joint, too, but if you’re out of that like I am sometimes, you can use tapioca starch like I do sometimes. (Maybe it’s a stretch that most people would have tapioca flour on-hand but once you try making this Brazilian cheese bread, you will always keep tapioca flour on hand, swearsies.) Anyhooz, use either one of those. Potato starch or mashed potato flakes would work, too. A few years ago I proudly overcame an aversion to eating chicken off the bone. I don’t know. I suppose as a kid growing up in the 90s eating chicken planks and fish sticks I wasn’t exposed to a lot of boney meats. I got over it and can now gnaw on a bone with the best of em. 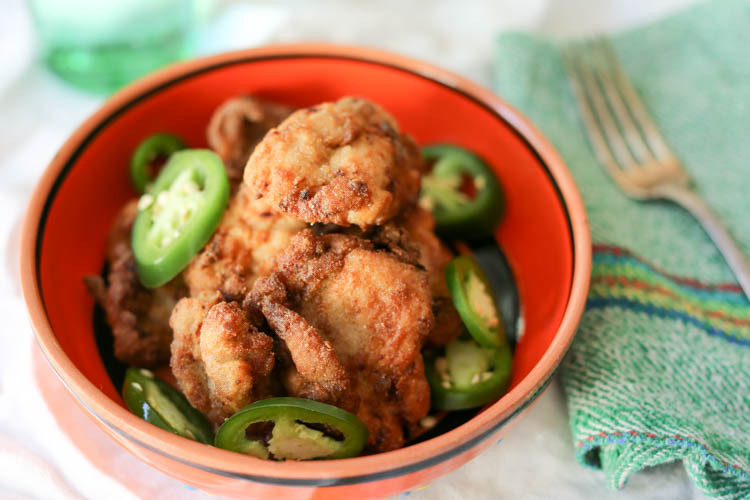 But still, for weeknight fried chicken I use boneless cuts because they’re faster to cook and easier to work with. Peep this ginger fried chicken for another example. 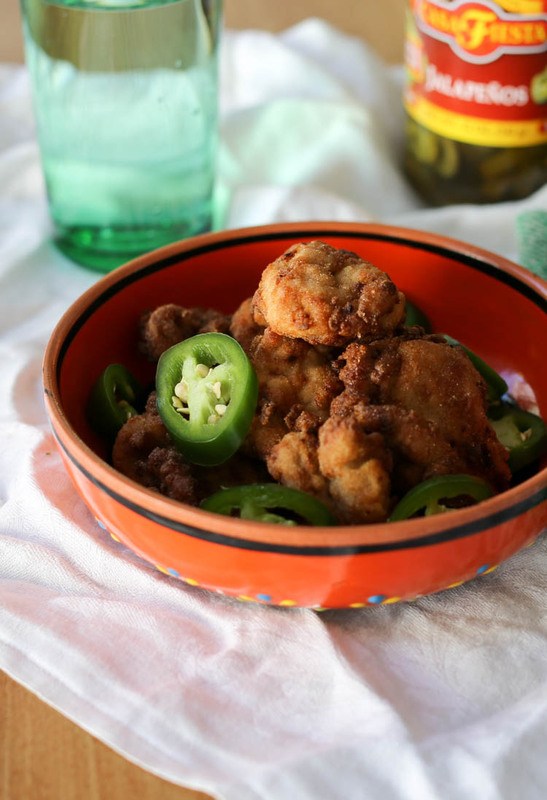 The spiciness of jalapeño fried chicken depends (obvs) on the spiciness of your pickled jalapeños. If you’ve looked closely, you’ve seen that some brands have a “mild” and a “hot” version. Why in the hell anyone would want mild jalapeños is beyond me and I strongly suggest using hot ones for this. That way chicken is a little spicy, but really not too far into the fire. If you use mild ones, you might as well just use pickle juice, imo. Blend the jalapeños and garlic together to make a puree. 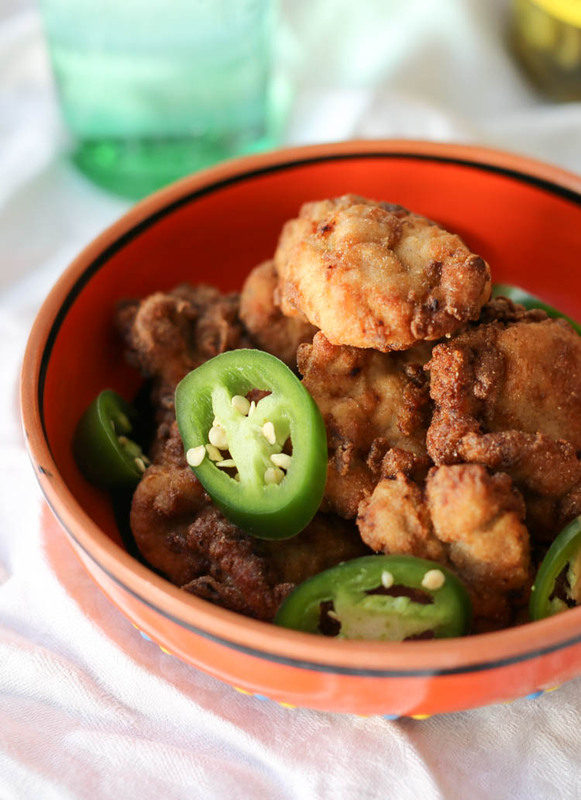 Cut the chicken into “nugget” sizes (about 1″ by 2″) Pour the puree over the chicken in a glass container. Cover and refrigerate 4-10 hours. 30 minutes to an hour before you want to eat, pull the chicken out of the fridge and add in the yogurt. Mix well to coat. Remove chicken pieces from marinade and roll in flour mixture a few pieces at a time. Set on a rack to “dry”. Allow chicken to sit at room temperature for 20-30 minutes. Heat oil to 350 degrees F. Use a deep pot to avoid bubbling over. Oil needs to be at least an inch deep. Fry the chicken, 3-4 pieces at a time for about 4 minutes total, turning once. Keep the oil temperature between 340-360ºF. Chicken will be cooked once the exterior is a deep crisp brown. You will need to fry in several batches to avoid crowding the pan. Drain on another rack rather than paper towels. I thought of Chicken wings when reading this?. I love that you finished it with slices of jalapeño! Looks hot and delicious. I’m going to try it this weekend! Thanks for the recipe. Question on adding the yogurt. Do you add the yougurt directly to the marinade or remove the chicken from the marinade and coat with yogurt? Sorry that wasn’t very clear! I just meant to pull the chicken out of the fridge. You can leave all the marinade on it and just mix in the yogurt, then strain it and roll in flour. (Now that I think about it, you could probably just add the yogurt to the marinade at the beginning of the process but I haven’t tried it that way.) I’ve amended the recipe to be more clear. Thank you, I have a very literal brain, which causes me much confusion with directions (and makes me extremely gullible to my husband’s jokes). I really appreciate your response, and I’m looking forward to these spicy delights Monday night. I know this might be a stupid question but can i use buttermilk too?